Through no actual planning on my part, my hotel here in London is an easy twenty minutes' walk from the amazing Shaukat Fabrics, so guess where I ended up fairly soon-like after arriving in London? That above is a picture of ONE of the Liberty Tana lawn walls; please to be clicking here and here for other views. I bought half as much as I did on my last trip, but, considering that 1) the dollar has sunk quite a bit since then and 2) I haven't exactly sewn up all I bought last time, I don't feel as if I wasted my opportunities. And three other pieces: two of the cricket-balls print (possibly called Schlesinger? Anyway, I want to make a BIG shirtdress in that) and one (about three meters) of the neuron print (that's not its actual Liberty name, but that's what I call it). 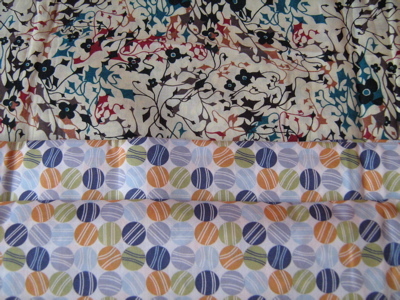 I could have bought fabrics that I *didn't* already own in other colorways, fibers, and weights, but what would be the fun of that? 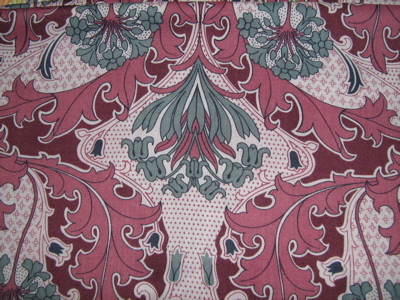 In an ideal world, I'd only wear Liberty print everything … the same patterns in wool, babycord, cotton lawn, and cotton twill, over and over again. Yet to come: a trip to actual Liberty, and possibly Muji — anyone want to tell me which branch of Muji in London is the best? Oh my goodness – you’re in the same city as me! No wonder it’s been feeling much cooler round here the last few days :)I’m ashamed to say I haven’t yet been to the V&A exhibit – despite working at Imperial College, right opposite, and having bought a membership so I could go for free every lunchtime! 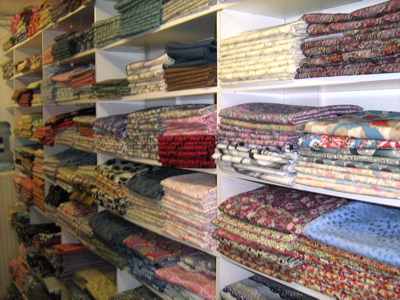 Must go soon as there’s only 26 lunchtimes left before it closes…If you happen to be in west London at all during your trip, visit the fabric shops on Goldhawk Road between the tube station and Shepherd’s Bush Green – there’s about 9 or 10. It’s not necessarily great quality fabric, but they all have enormous, which is all amazingly cheap (for the UK ;). There’s also several shops selling sari silks and African prints. Erin, I’m so pleased you made it to the V&A – I took out membership due to the exhibition, and have been twice so far. If you do want the book of the exhibition, I found a hardback copy of it cheaper than at the V&A in a bookshop near SouthKensington tube stationI’d also recommend the Goldhawk Road shops – one of them, on the opposite side of the road from the underground station also has liberty fabrics, at slightly cheaper prices than Shaukat, and some real bargain basement stuff downstairs. As for Muji. There is quite a big one near Covent Garden tube station. On Long Acre, close to the travel bookshop, Stanfords. Oh, and I meant to add, 10 mins from Shaukat, on Old Brompton Road, near the turning which leads to Gloucester Road tube station is a nice Belgian Brasserie – Abbaye. Nice food and beer at not extortinate prices. oh my… Shaukat has an online shop now, too! That’s even easier than trudging over to West London!I had so much fun yesterday traipsing around the V&A with you yesterday! That exhibit was two hours of pure bliss, I’m dreaming of nipped in waists, full FULL skirts, and tailored tweed jackets now! I’ve loved my visits to London and I hope you check out some of the shops that sell gorgeous sari silks. Oh, Erin, (big sigh here) thank you for sharing your travels. If only technology allowed us to feel those fabrics. Your descriptions and pictures almost make me want to pack up and fly over all that scary water just to browse those fabric stores. It was lovely to meet you yesterday Erin – thank you for a great afternoon, and for introducing me to Melissa! And thanks to everyone’s comments, I now know more fabric shops to visit.I find it hard to say which London Muji is the best though.If I’m after something specific, I tend to head to Oxford Street/Carnaby Street as they’re very close together, so between them I can usually find what I want. Plus the branches Tottenham Court Road and Covent Garden (Long Acre) are within walking distance too.The downside is the West End can get very busy and there are nicer places to go shopping. Hee – I *have* been to the Couture exhibition twice, and actually had a ticket to go four times. Do I win a prize?! I loved it all, including Miss Lachasse and her world’s smallest stockings… I thought the book was a bit uninspiring though (Cassie, if you’re reading this, please could you respectfully ask the books dept to shell out for some decent photography for once, that will do the clothes justice!! )If you’re in the Liberty area anyway, RD Franks is always worth a look for its books – it moved locations recently and managed to completely mislay its atmosphere in the process, but it still has a fabulous collection of (fashion/clothes/sewing/costume related) books, it just takes longer to unearth the more interesting ones. And the Art Bar cafe on the 2nd floor of Liberty’s is a lovely place for lunch. wow, I have never seen a wool like that before and I am in LOVE! California just isn’t the place to be for wool. Anytime I buy it the people at the cutting counter always do a double take and ask me what I’m doing, like no one sews with it anymore. I’ve been trying to go to London, my husband goes fairly often but he isn’t a fan of the place, so we haven’t made a trip out of it. I don’t think he’ll go for my rationale of the fabric stores I read about on a blog. So for now, thank you Erin for the pictures! I’m so jealous that you’re in London! I must find a job that sends me there regularly . . .I didn’t sew when I lived in London, so my memory may be faulty, but I don’t remember the fabric selection at Liberty being all that big–I just remember seeing the Kaffe Fassett fabrics. I must not have found the right place! I do remember the wide array of needlepoint projects, though. My very dear friend bought me a beautiful one of an Indian cow that came in a zippered velvet bag that you use to make it up into a pillow. [Happy sigh] I love London! Have fun! Look how much fun you’re having! Yay for you! I hope you get some great photos (and whatever else) at Liberty! I was at the V&A on Sunday and saw the exhibit. I sort of went to London just for it to be honest. The highlight for me was Zemire. Oh what an outfit. And the story behind it is incredible, how they restored it! I wanted every single cocktail dress I saw. sigh. The V&A makes me weep with joy.